Maria Butina's father Valery Butin said he would be grateful to the defense attorneys if they clearly reiterated that Maria was facing "groundless accusations"
BARNAUL, November 29. /TASS/. The family of Maria Butina, a Russian national arrested in the United States, expects her defense to make a pre-trial deal with the prosecution, Maria’s father Valery Butin told TASS on Thursday. According to earlier reports, the defense and the prosecution are optimistic about the possibility of a pre-trial deal and have requested the court to postpone the filing deadline. At the same time, they requested that the date of the next status hearing, which is December 19, remain unchanged. "I would very much like them to make a deal because if they fail to do it… the prison term may turn out to be so long that we will lose our daughter," Valery Butin said, adding that he would be grateful to the defense attorneys if they clearly reiterated that Maria was facing groundless accusations. According to Butin, he talked to his daughter on the phone on Thursday. Maria was moved to an individual cell eight days ago and it has been hard for her to endure daily 22-hour isolation, the father said. 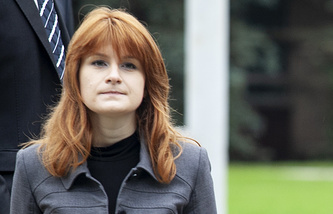 Russian citizen Maria Butina, 30, was arrested in Washington DC on July 15. According to the US Department of Justice, she is suspected of acting "as an agent of Russia inside the United States by developing relationships with US persons and infiltrating organizations having influence in American politics, for the purpose of advancing the interests of the Russian Federation."